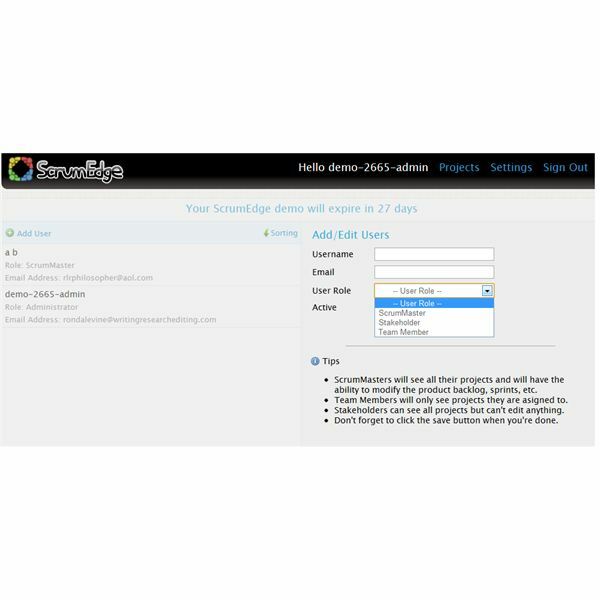 Scrum Edge is an on-demand tool created for the use of Scrum professionals. The purpose of the program is to allow those using it to collaborate on their Scrum projects and track their progress through all stages of the Scrum process. Users will find that there is a variety of features made available to users. This means that from product backlog through sprint planning through developing a shipable product, the program is there with its users. One of the more interesting aspects of Scrum Edge is that users can suggest and vote for features they would like to see in future editions. 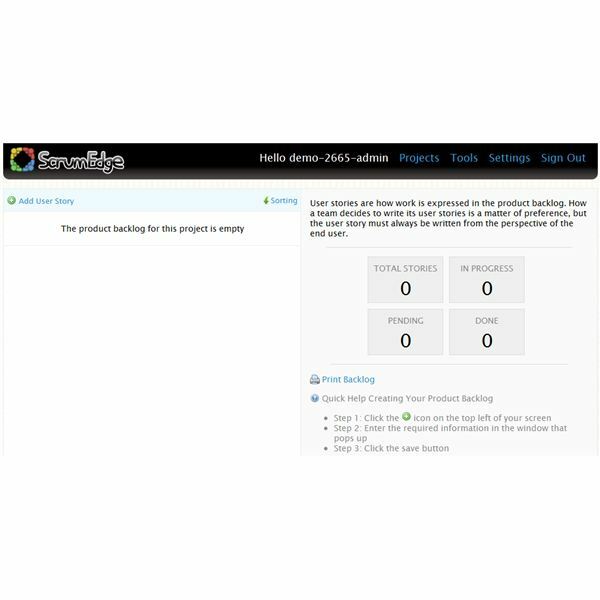 Will Scrum Edge provide the assistance you need? I tried the program out, played around in it, and came up with the following conclusions. Because the program is delivered to users via an online subscription, the installation of the program is extremely simple. 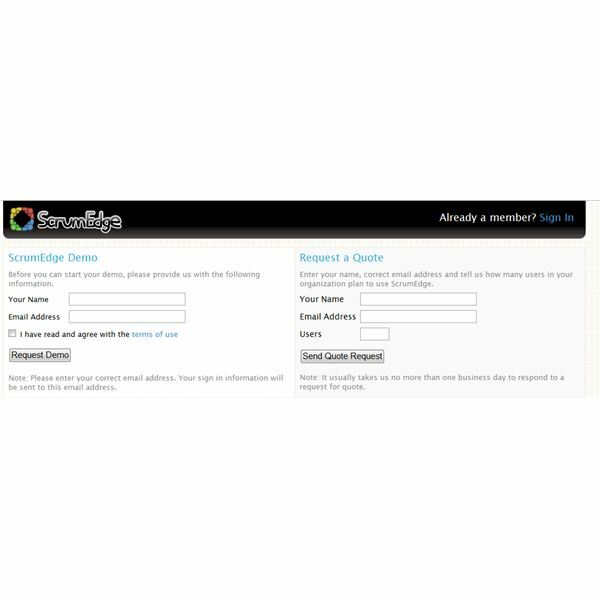 Simply sign up for the tool, and you're able to access and manipulate your dashboard. I was able to get things going in a matter of minutes. I'd suggest signing up for a demo first, to make sure you enjoy the program. When I signed up for the trial run of Scrum Edge, I was provided with a temporary user name and password. The setup of the program is where I found it got kind of clunky. Instead of designing your Scrum project in a more circular fashion, I found that the program wanted you to set up your project in a linear fashion. This is all well and good when you're working in such a fashion, but if you're like me, and you tend to think in terms of setting up things as they come to you, you might find this forced linear thinking to be somewhat burdensome. On the other hand, because of the way things are set up, this linear process means that you won't forget anything that is necessary. Perhaps other people have found the program more intuitive, but to me, I found the program difficult to navigate. For instance, when I wanted to work on creating the project, I was asked to first create my team. It took a lot of fiddling around with the program to figure out how to get it to do what I wanted it to do. On the other hand, it should be noted that the program features lots of help and resources, and I did not tap into them when trying the tool out. Instead, I just began diving in, as I normally do when testing programs. I found myself becoming quite frustrated. The other problem I had in terms of ease of use when it came to using Scrum Edge was with the navigation for the dashboard. There are really only three top-level dashboard tabs you start out with "Projects," "Settings," and "Sign Out." For some individuals, this may be a program that is incredibly easy to use, however, being someone who is used to the ribbon-style navigation found in Microsoft products and many other popular products on the market, I did not find navigation intuitive in this program. As you add your team members, you'll only be adding their username and email addresses, as well as indicating whether the individual is an active participant of the team or not. The problem I had with this approach is it doesn't appear to allow you to record any contact information outside of the email. This means you'll need to maintain a separate database with team member contact information in case someone needs to be reached regarding the project. stage the project is in (complete, in planning, or in progress), and select who the Scrum Master will be for that given project. You'll then need to highlight who the team members will be (it took me a few tries to realize I needed to click once on each box with the team member's name in order to select team members for the project). Once you've put it together, then you can save and move on to the next step. Once you click on the name, you'll be taken to a dashboard. In order to get anywhere on this dashboard, you'll have to click "Add user story." This will pull up a window where you are then able to enter individual story information. You'll give the story a name and a priority; choose whether it is done, in progress, or pending; and write a description of that story. You'll need to add a sprint to the project, give the sprint a name, choose its length, start date, and demo date. So make sure that you add your sprints. 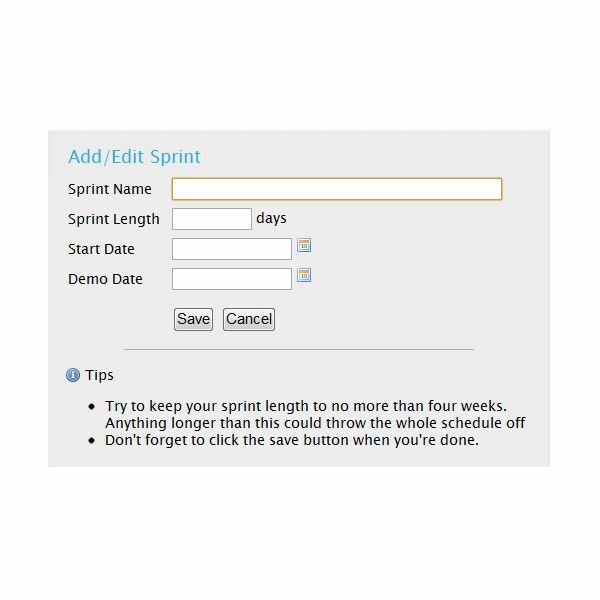 Once the sprint has been completed, you can then enter in your sprint backlog information. 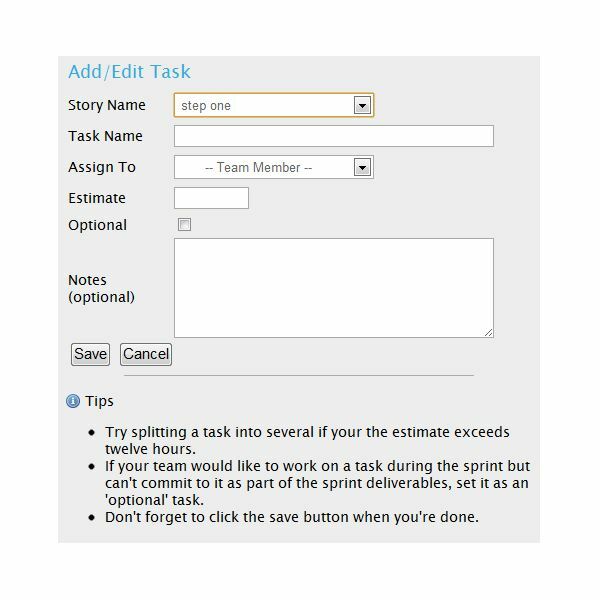 In order to add a sprint task, you have to have had the task listed in the product backlog. Simply select the task, assign it, estimate the length of time it will take to complete, and save. The program doesn't have a lot of bells and whistles, but the features it does have are quite useful – especially if you're someone who gets easily distracted by all the bells and whistles involved in other software programs. Rather than charging a monthly subscription fee for a particular package involving users and memory space, Scrum Edge charges yearly per user. The cost per user of the program is $35. If you have a small team of ten people, then the program will cost you $350 a year or approximately $29.16 a month on average. Depending upon what you're looking for in your software, this is less expensive than many of the other options available, but remember that it also does less stuff than a program like ScrumDesk is equipped to do. This is where Scrum Edge shines. There is a lot of support for the program – not only by way of program documentation, but also by way of support for those using Scrum methodologies. 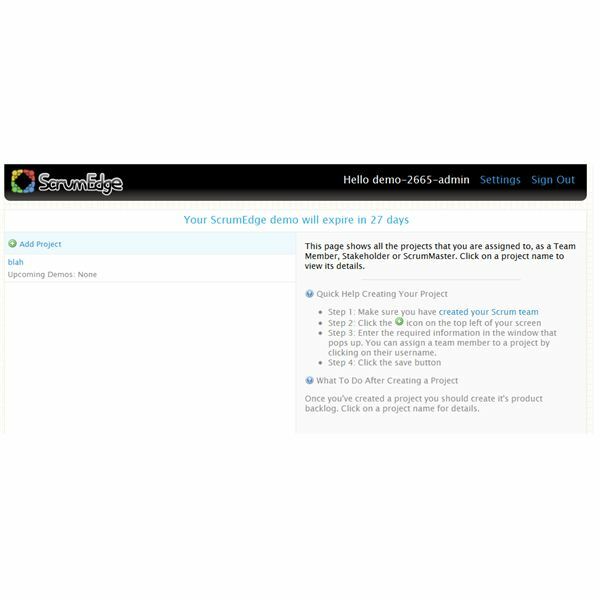 The website contains a wealth of information for individuals wishing to learn the proper way to implement Scrum Edge in their activities. Even if you wind up not choosing this software option for use in your office, it is very much worth it to investigate the information available on the website. So…Is Scrum Edge for You? Scrum Edge is for those individuals who want a Scrum management tool that doesn't have a lot of bells and whistles. For me, I found the program did a lot of necessary tasks, but that it was clunky and difficult to navigate. I'm a big fan of programs that have menus across the top that allow for you to plan your projects as things come to you. While you are able to do this once you've created your team and put the project together, I still found it somewhat difficult when it came to navigation. Overall, this program came out with a rating of 3.2 – it's about average. It's not the easiest or most fully featured program on the market, but if you're needing something that gets the job done for a cheap price, then it might be worth it to you to look into using it.